Despite what you may have heard, Costa Rica is not an island! In fact, it is on the Central American isthmus that connects North America and South America. 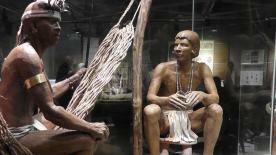 Geographically speaking, it is part of North America while its cultural heritage is Latin American. Costa Rica is bordered by Nicaragua to the north and Panama to the south and east. The Pacific Ocean borders the western and southern parts of Costa Rica, and the Caribbean Sea borders Costa Rica on the east. 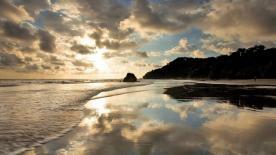 Costa Rica comprises a total of 19,700 square miles and has 277 square miles of territorial waters. The highest point in Costa Rica is Cerro Chirripó, at 12,530 feet, the highest volcano in the country is the Irazú Volcano 11,257 ft. 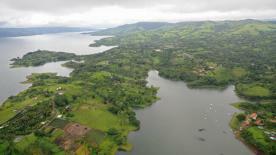 The largest lake in Costa Rica is Lake Arenal, with the surface of 33 square miles and depth that reaches 200 feet. It was artificially enlarged to its current size with the construction of a hydroelectric dam in 1979. In terms of latitude and longitude, it is located between 9 and 10 degrees north of the equator within the latitudinal belt known as the Tropics. The climate is tropical, with mild temperatures all twelve months, ranging from low 70°s to mid 90°s. Due to the change in topography throughout the country, from high mountains to beaches there can be large differences in humidity and temperature. There are two distinct seasons: dry & green, and both have their own advantages when visiting, making a Costa Rica vacation possible year-round. Famous for its towering mountains, active volcanoes and dramatic valleys, it is the unseen forces that created this impressive landscape which tend to go unnoticed by those that vacation to Costa Rica. Geologically speaking, Costa Rica is one of the most fascinating countries in the world. Thousands of tourists come to Costa Rica every year to enjoy the crystal-clear waters of the Caribbean Sea and Pacific Ocean, but many don’t realize just how interesting the seabed beneath Costa Rica is. The country itself technically sits at the convergence of five tectonic plates—the North and South American, Caribbean, Cocos and Pacific plates. Tectonic plates are parts of the Earth’s crust upon which continents sit. These plates are in constant motion, although they move far too slowly for the naked eye to register. For geologists, however, tectonic plate shifts say a great deal about everything from a country’s terrain to its predisposition to earthquakes. The geological pressure of tectonic plate movement creates sweeping mountain ranges as the plates collide with one another. As one plate becomes forced under another, the resulting pressure creates volcanoes, as magma boils up from beneath the Earth’s surface and forces its way out through volcanic craters. Costa Rica is home to dozens of volcanoes, many of which are still active. Poas Volcano is one of the most impressive and, although the last major eruption occurred in 1910, steam and ash can still be seen spewing from the mountaintop regularly. Other active volcanoes in Costa Rica include Irazu and Turrialba in the Central Highlands, Arenal in the Northern Lowlands, and Rincon de la Vieja and Tenorio in Guanacaste. Just as the collision of tectonic plates created Costa Rica’s volcanoes, it also resulted in the formation of the country’s five major mountain ranges – the Cordillera Central, Guanacaste, Talamanca and Tilaran ranges, and the Cerros de Escazú. The Tilaran Range is home to Arenal Volcano, while the Cordillera Talamanca is where visitors can find the tallest mountain in Central America, Cerro Chirripo. Evidence of Costa Rica’s prehistoric origins can be found everywhere. For example, many of the rocks that litter the country’s deepest valleys and gorges are ophiolites, rocks that were originally part of the ocean floor. Some of these stones can be around 180 million years old. Ophiolites are particularly common in southern Guanacaste and Puntarenas. Certain regions of Costa Rica’s Central Valley are also strewn with oceanic sedimentary rocks, particularly the region surrounding Cerro Chirripo, Costa Rica’s tallest mountain. As you now know, Costa Rica is situated in Central America which means no jet lag for most travelers from North America—usually it’s just an hour or two time difference. Being so close to the equator, Costa Rica has no need to enact Daylight Saving. The days and nights are roughly equal (12 hours) in length year-round.